Pednekar did her schooling from Arya Vidya Mandir in Juhu Mumbai. She was an assistant casting director for six years with Shanoo Sharma of Yash Raj Films before venturing into acting. Pednekar played the role of Sandhya Varma, an obese girl in her debut film Dum Laga Ke Haisha (2015), opposite Ayushmann Khurrana. To play the part of an overweight woman, she gained close to 12 kg, despite being slightly overweight before the shooting had commenced. Rajeev Masand wrote in his review: "Pednekar steals the film with an assured turn, effortlessly making you care for Sandhya, without ever reducing her to a slobbering, self-pitying caricature." After filming, she began losing weight and shared methods and tips of the process through her social media. She lost significant weight before the release of the film. The film proved to be a sleeper hit and Pednekar won the Filmfare Award for Best Female Debut for the film. That same year, Pednekar appeared in Y-Films's mini web-series Man's World. The four-part series about gender inequality premiered on YouTube on 29 September 2015. It also featured the actresses Parineeti Chopra, Kalki Koechlin and Richa Chadda. After a year of absence from the screen, Pednekar appeared in Shree Narayan Singh's directorial debut Toilet: Ek Prem Katha (2017), alongside Akshay Kumar, which tells the story of a young woman in rural India who insists on the eradication of open defecation. Despite disliking the picture, Saibal Chatterjee of NDTV praised Pednekar for "flesh[ing] out a refreshingly relatable college topper who becomes the principal catalyst for a mini-revolution". The film proved to be a major commercial success with worldwide earnings of over ₹3.11 billion (US$43 million). Pednekar followed the success of Toilet: Ek Prem Katha with the comedy-drama Shubh Mangal Saavdhan (2017), a satire about erectile dysfunction. Directed by R.S. Prasanna, it marked her second collaboration with Ayushmann Khurrana. Reviewing the film for The Indian Express, Shubhra Gupta wrote that Pednekar "once again reminds us just how convincing she can be as a real honest-to-goodness young woman in search of love", but bemoaned that she was being typecast in such roles. It earned ₹640 million (US$8.9 million) against its ₹250 million (US$3.5 million) budget and earned Pednekar a nomination for the Filmfare Award for Best Actress. In 2018, Pednekar was featured by Forbes India in their 30 Under 30 list. Her sole screen appearance that year was in Zoya Akhtar's segment in the Netflix anthology film Lust Stories (2018), in which she played a maid who has an affair with her employer. Writing for NDTV, Raja Sen considered Akhtar's segment to be the best among the four films in the anthology, and found Pednekar "hauntingly good" in it. The following year, Pednekar played a young housewife on the run in rural Chambal in Abhishek Chaubey's ensemble crime film Sonchiriya, co-starring Sushant Singh Rajput and Manoj Bajpayee. She underwent two and a half months of physical training to portray her character's mannerisms and gait; she also learned to fire a gun. Rahul Desai of Film Companion praised the subtlety in the film and its performances, and credited Pednekar for "lend[ing] an inevitable sense of womanhood to the silenced". Pednekar will next star in Alankrita Shrivastava's comedy Dolly Kitty Aur Woh Chamakte Sitare, co-starring Konkona Sen Sharma, and in the sports film Saand Ki Aankh, in which Taapsee Pannu and her portray sharpshooters Chandro Tomar and Prakashi Tomar. She will team with Ayushmann Khurrana for the third time in Bala, a satire on physical attractiveness, after which she will star alongside Kartik Aaryan and Ananya Panday in a remake of the 1978 film Pati Patni Aur Woh. Pednekar has also committed to feature in Takht, a historical drama directed by Karan Johar, which features an ensemble cast, including Ranveer Singh, Kareena Kapoor, Alia Bhatt, and Vicky Kaushal. ^ Sangghvi, Bhavikk. "Movie prediction for ´Dum Laga Ke Haisha'". Planet Bollywood. Archived from the original on 1 August 2016. Retrieved 4 June 2016. ^ a b "15 women of courage share their inspiring stories". India Today. 11 June 2015. Archived from the original on 22 April 2016. Retrieved 4 June 2016. ^ "Bhumi Pednekar: I love vanity as a woman". Archived from the original on 2017-09-05. Retrieved 2017-09-03. ^ a b Presenting Dum Laga Ke Haisha’s leading lady Bhumi Pednekar, the slim-fit version Archived 2016-02-07 at the Wayback Machine, Retrieved 26 January 2015. ^ a b ‛Lose it’ like Bhumi Pednekar! Archived 2015-11-26 at the Wayback Machine, Bhumi Pednekar has shared "the fun little things" she did to lose weight. ^ My Cinderella Story: Bhumi Pednekar Archived 2015-07-18 at the Wayback Machine, DNAIndia 7 March 2015. ^ "Think Big!". RajeevMasand.com. 27 February 2015. Archived from the original on 15 August 2017. Retrieved 15 August 2017. ^ 7 things you don't know about Bhumi Pednekar. 6th is shocking Archived 2015-11-30 at the Wayback Machine, India Today. ^ "Filmfare Awards 2016: Ranveer Singh bags Best Actor in leading role for Bajirao Mastani". ibtimes. 16 January 2016. Archived from the original on 18 January 2016. Retrieved 22 January 2016. ^ Singh, Prashant (17 March 2015). "NH10 and more: Sleeper hits, a new trend in Bollywood". Hindustan Times. Archived from the original on 15 August 2017. Retrieved 15 August 2017. ^ "Man's World". www.yashrajfilms.com. Archived from the original on 2018-01-23. Retrieved 2018-01-22. ^ Basu, Nilanjana (27 September 2015). "Parineeti, Kalki, Richa Show it is So Not a Man's World in Trailer". NDTV. Archived from the original on 9 October 2015. Retrieved 18 October 2015. ^ "Bollywood celebs bat for gender equality with 'Man's World'". The Indian Express. 26 September 2015. Archived from the original on 28 October 2015. Retrieved 18 October 2015. ^ Iyer, Meena (11 August 2017). "Toilet: Ek Prem Katha Movie Review". Times of India. Archived from the original on 11 August 2017. Retrieved 12 August 2017. ^ Saibal, Chaterjee (11 August 2017). "Toilet: Ek Prem Katha Movie Review - Akshay Kumar's Film Stinks To High Heaven". NDTV. Archived from the original on 11 August 2017. Retrieved 12 August 2017. ^ "Toilet Ek Prem Katha Emerges a Blockbuster". Box Office India. 14 August 2017. Archived from the original on 15 August 2017. Retrieved 15 August 2017. ^ MK, Surendhar (18 June 2018). "Toilet: Ek Prem Katha trumps Baahubali 2 in China; becomes Akshay Kumar's first film to cross Rs 300 cr mark worldwide". Firstpost. Archived from the original on 28 June 2018. Retrieved 11 July 2018. ^ "Ayushmann Khurrana, Bhumi Pednekar in Anand L Rai's Next Film". NDTV. October 22, 2015. Archived from the original on June 12, 2018. Retrieved March 13, 2018. ^ Gupta, Shubhra (1 September 2017). "Shubh Mangal Saavdhan movie review: The Ayushmann Khurrana and Bhumi Pednekar film suffers from a sagging climax". The Indian Express. Archived from the original on 12 June 2018. Retrieved 9 June 2018. ^ "Shubh Mangal Saavdhan". Box Office India. Archived from the original on 7 January 2018. Retrieved 3 August 2018. ^ "Nominations for the 63rd Jio Filmfare Awards 2018". Filmfare. 19 January 2018. Archived from the original on 12 June 2018. Retrieved 9 June 2018. ^ "30 Under 30 2018". Forbes India. Retrieved 5 September 2018. 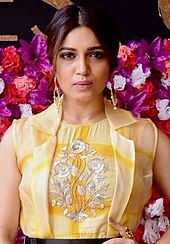 ^ "Bhumi Pednekar on 'Lust Stories': 'I was wiping floors at home for weeks. My mom loved it'". Archived from the original on 2018-06-27. Retrieved 2018-06-26. ^ "Lust Stories Movie Review: 4 Directors Explore The Idea Of Lust, Without Caution". NDTV. 29 July 2018. Archived from the original on 27 July 2018. Retrieved 3 August 2018. ^ "Vidya Balan in Ishqiya, Alia Bhatt and Kareena Kapoor in Udta Punjab, Bhumi Pednekar in Sonchiriya: Abhishek Chaubey's cinematic world of women and the actors who inhabit them". Mumbai Mirror. 27 February 2019. Retrieved 1 March 2019. ^ "Sonchiriya Movie Review: Mind Transcends Gun In Abhishek Chaubey's Haunting Bandit Tale". Film Companion. 1 March 2019. Retrieved 1 March 2019. ^ a b "Dolly Kitty Aur Woh Chamakte Sitare Poster: Konkona Sen Sharma And Bhumi Pednekar 'Join The Rebelution'". NDTV. 15 October 2018. Retrieved 16 October 2018. ^ a b "Saand Ki Aankh: Taapsee Pannu and Bhumi Pednekar kick off Anurag Kashyap's production". India Today. 9 February 2019. Retrieved 1 March 2019. ^ Bhattacharya, Roshmilla (8 December 2018). "Ayushmann Khurrana, Bhumi Pednekar reunite for Amar Kaushik's next directorial, Bala". Mumbai Mirror. Retrieved 8 December 2018. ^ "Kartik Aaryan Teams Up with Ananya Panday and Bhumi Pednekar for Pati Patni Aur Woh". CNN-News18. 19 January 2019. Retrieved 19 January 2019. ^ "Check out: Kartik Aaryan, Ananya Panday and Bhumi Pednekar starrer Pati Patni Aur Woh goes on floors". Bollywood Hungama. 4 February 2018. Retrieved 4 February 2018. ^ "Pati Patni Aur Woh' release preponed to December 6". Business Standard. 26 February 2018. Retrieved 24 March 2019. ^ "2018 Archives - Zee Cine Awards". Zee Cine Awards. Archived from the original on 2017-12-31. Retrieved 2017-12-31. ^ "DadaSaheb Phalke Film Foundation Awards 2018: Akshay Kumar, Sonam Kapoor Bags Best Actor Awards - SKJ Bollywood News". SKJ Bollywood News. 25 April 2018. Archived from the original on 26 April 2018. Retrieved 7 May 2018. ^ "Nominations for the 63rd Jio Filmfare Awards 2018". filmfare.com. Archived from the original on 2018-01-19. Retrieved 2018-01-18. ^ "Reel Movie On Screen Awards 2018 | Best Film, Actor, Actress, Director and More". News18. Archived from the original on 2018-02-26. Retrieved 2018-02-27. ^ "IIFA Nominations 2018: Tumhari Sulu Leads With 7 Nods, Newton Follows". NDTV.com. Archived from the original on 2018-05-27. Retrieved 2018-05-28. 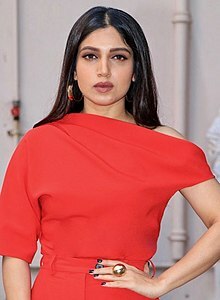 Wikimedia Commons has media related to Bhumi Pednekar.